Milestones are the significant cultural and developmental markers that we experience throughout our years of life. They are our firsts. There are ordinary firsts of steps and teeth, walking and talking. There are also firsts of our faith life: baptism, beginning Sunday School, receiving a Bible, our first retreat, making decisions for Christ, and more. Faith Milestones are those firsts as we grow in our faith experiences because we know it doesn’t happen just on Sunday mornings. It’s part of all we are and all we do as God’s beloved people. Attending a CEF (Christian Educator’s Fellowship) national conference last year gave me the jumping off point to identify intentional firsts, presented as Faith Milestones, for our little people journeying through children’s ministries. A huge thanks goes to Donna Draeger, Minister of Disciple Formation at Centennial UMC in Roseville, Minnesota and Deb Johnson, Children, Youth, and Family Minister at Spirit of Hope UMC in Golden Valley, Minnesota for leading the workshop that got this ball rolling around in my head. It was important these Faith Milestones were in partnership and shared with the whole family as we sought to help families find ways to grow in their faith together. We wanted shared spiritual experiences for our families and decided to put a few ages together just in case a family missed it the first time. I calendared throughout the year based on our church’s rhythm of activities and wanted to introduce as much faith-filled vocabulary as possible for these firsts. I put out a brochure (old school, I know, but it has all the dates on it for the year and that seems to work best for my parents to be able to keep up with it, especially those with more than one child.) I also put it in the monthly newsletters, bulletins, and sent a personal invite as well as a personal email a few weeks out inviting families to preregister if a meal was involved. Ages 3 & 4 and any new rising kindergartner students: Welcome to Sunday School – Scheduled the Sunday before fall’s promotion Sunday from 12:15-1pm. Program: What does Sunday School mean? What do we do there? 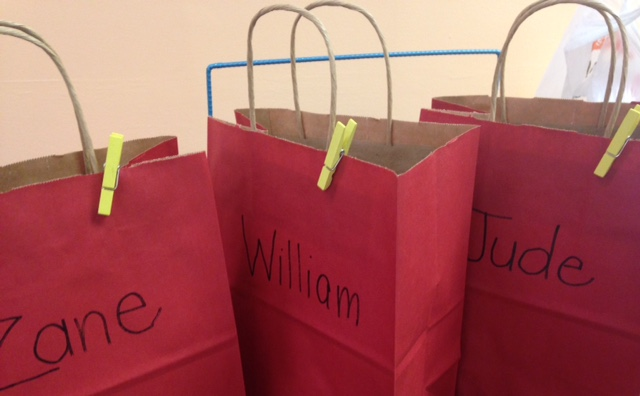 Through story, song, and hands-on activities, learn what a fun place Sunday School is! I invite a couple of the Sunday School teachers to participate so the families meet & greet and learn the routines. We play some songs, tour the children’s hallway, decorate a cookie, and we give out a copy of The Berenstain Bears Go to Sunday School to each student. The following week, I send a personal, handwritten post card as follow up inviting them to Sunday School. 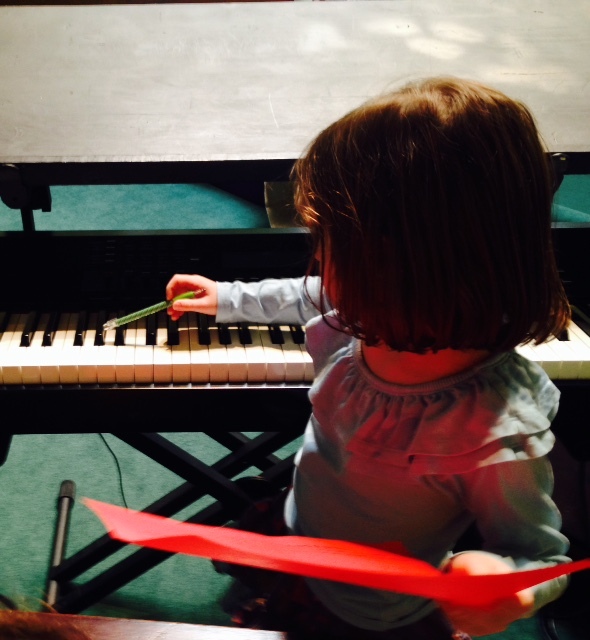 1st & 2nd Grades: Touch & See My Church – Scheduled on a Spring Sunday from 12:15-1:30 and includes a snack lunch – A chance to explore the sanctuary ‘behind the scenes’ and learn more about worship. 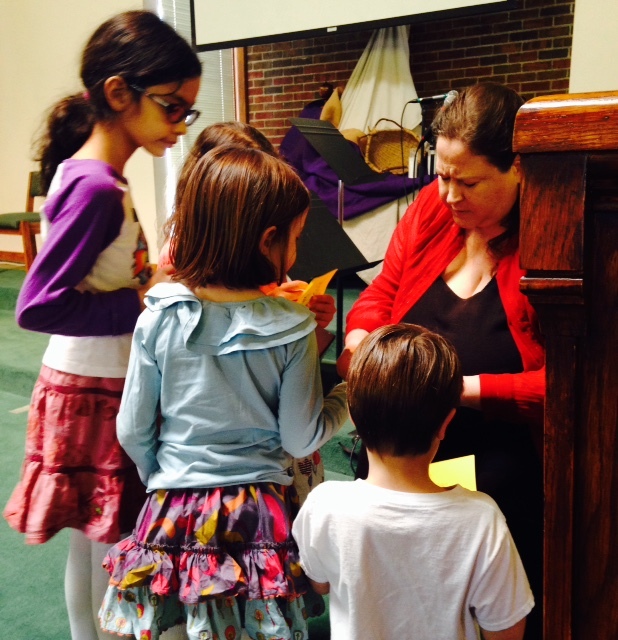 The students and their families will go on a scavenger hunt in the Sanctuary (What is the name of our pastor? How many pews are in the Sanctuary? What’s in the baptismal font? What’s bigger…the pastor’s office or church library?, What’s the color of the Sanctuary doors?, etc) I invite the worship leader, a musician, our senior pastor, a worship singer, an acolyte, and the church secretary to be a ‘station’ where the children ask each of 3 questions: What do you do? How did you get to do what you do? Where do you do what you do? Students receive a sticker at the end of each station because little people like stickers. 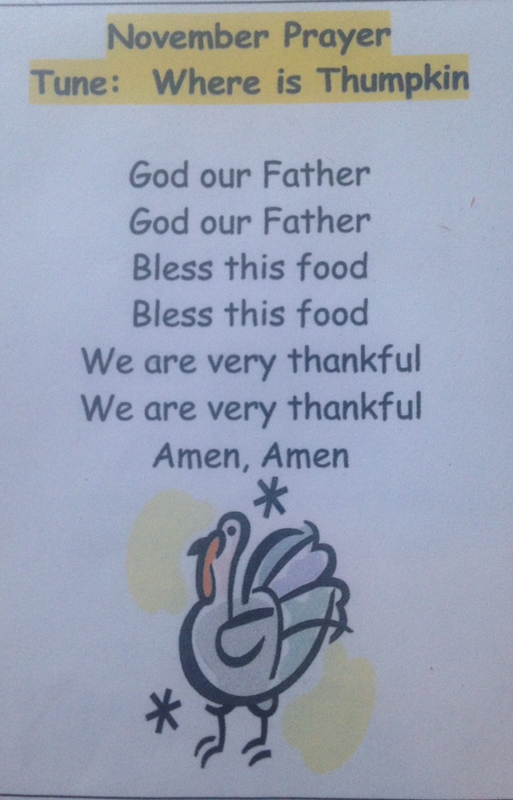 Their take-away is a search book of bible stories. This milestone is more involved, so I’ll post about this one next week. 3rd & 4th Grades: I Can Serve – Scheduled on a Sunday before Advent/November an hour before our CLUB345 gathering and led by our Senior Pastor. The students learn how they can ‘help’ in the worship service and practice communion, lighting and extinguishing candles, get a tour of the chancel/stage area, etc. 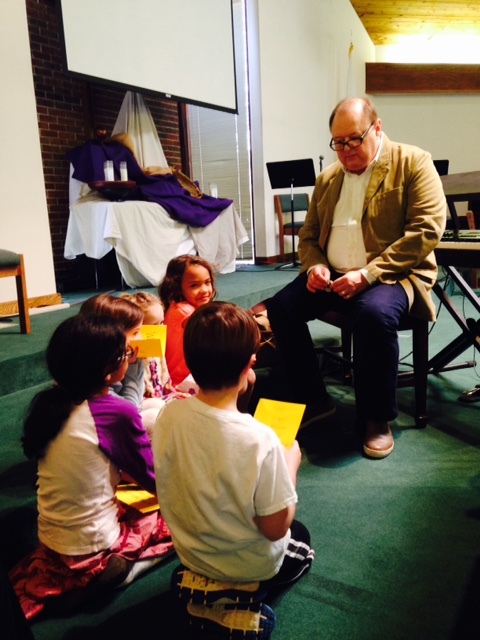 The students also get their first hands-on teaching on the sacraments of baptism and holy communion. This is also a very specific time when our students spend time with their pastor. Anytime I can build their relationships with our pastor, I’m all in! 3rd – 5th Grades: A Bible of My Own – A student late night 6pm-9:30pm to learn about the bible and how to use it in daily living. I’m in the process of writing this one now, so check out the blog later. Our church gives Early Reader Bibles to students entering 1st grade and NIV Red Letter edition bibles to those entering 3rd grade (they’ll use these for CLUB345) on the Sunday during worship before the first CLUB345. The scriptures share that Moses prepared the people of Israel to enter the Good Land by asking them to remember and tell the ways that they had experienced God’s love and care. In this way, he knew that faith in the God of Israel would live on. These shared spiritual memories are special and we have sought to set them apart as such. 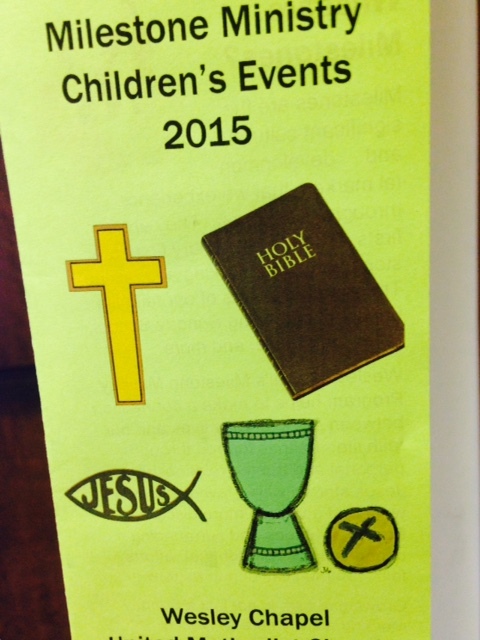 Engaging children and families to grow in relationship with Jesus through various prayer practices. Establishing prayer as a normal part of a family’s daily routine and tradition for passing on and experiencing the Christian faith. Outdoor ministry is a memorable, formative, and vital part of a child’s faith journey. The experience of going away to camp can renew and enhance spiritual growth. Families are invited to come for this special event where they tour the church, learn more about things like baptismal fonts, Bibles, Sunday School rooms, and choir. Memories are created reminding your child of this special place where they hear God’s promises and learn to live and love like Jesus. Learn how to use your Bible with the skills of a Ninja, both physically and mentally. At each station resembling the TV show American Ninja Warrior, students will learn the basics of studying the Bible as part of every day, thus building their spiritual muscles as a follower of Jesus. Graduating 5th graders, as well as middle school youth) can serve as co-leaders in VBS after learning how to lead and serve our smallest disciples. Students will learn Safe Sanctuary guidelines and appropriate child care-giver systems. July – Day of Service Retreat With Ms. DeDe (rising 5th & 6th) 7/17 10am-5pm Ambassadors will prepare spaces and supplies for fall children’s ministry programming and last week of summer kid’s camp happening the following week along with fun, fellowship, and learning what the Bible says about being a true blue friend. 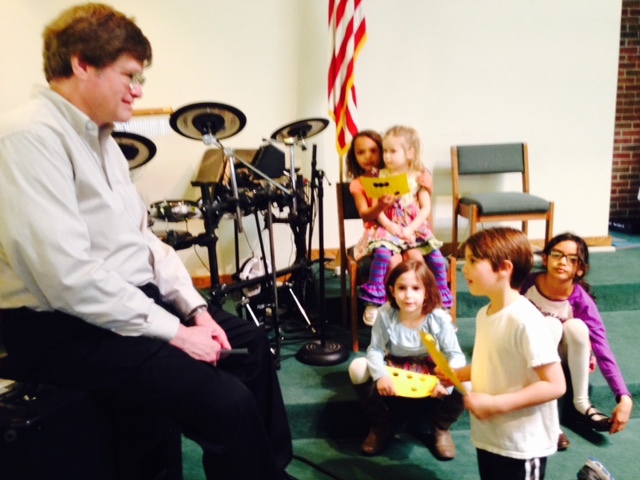 A special time to welcome preschoolers and their families to Sunday school. This meet and greet event includes hearing a Bible story in The TreeHouse, singing songs, and meeting Sunday school teachers. Wear your backpack to the Children’s Message at any of the worship services and receive a special blessing as the new school year begins. Outdoor ministry is a memorable, formative, and vital part of a child’s faith journey. The experience of going away to camp can renew and enhance spiritual growth. Students will attend overnight camp from Friday pm through Sunday midday with other students from North Georgia Conference local churches. Learn the how and why we say, “Yes!” to Jesus as He invites us to the table as his friends for Holy Communion. Students are offered an opportunity to take on various leadership roles in the year to come. Expectations and learning to serve using their gifts and graces in their home church and in the world. We began last year to intentionally provide training along age lines as rights of passage for students called Faith Milestones. I Can Serve offers an invitation and an expectation to include and engage children in worship for students in 3rd-5th grades. This year, we kicked it up a notch. We have a Sno Cone machine, a Popcorn machine, and a Spin Art machine to add that little something special to events, hot summer after-church-times of fellowship, and great fun to ministry with children. Including training and practice with these items invite the students to share in hospitality to other students. Teaching one machine at a time included set-up, safety features, possible dangers, how to speak to others we serve, and the all important clean-up. A job done is only done well with training and practice. To everyone’s delight we taste-tested everything and spoke about partnering with one another to serve well as Jesus never sent out his disciples one at a time, but two and three at a time. By the end of the day, students have been trained and practiced lighting the candles on the communion table, serving the juice at communion, speaking into a microphone, running the sno cone machine, spin art machine, and serving from the popcorn machine. How are you training up the current and future leaders in your church in service and hospitality? We’ve saved this Faith Milestone until November as we prepare for Advent and other special Sundays that seem to fall in quick succession in the Liturgical calendar year. We invite the students 3rd-5th grade to attend training with our Pastor to learn the ins and outs of serving in the worship service. These acolytes (helpers) learn what to say, how to give eye contact, the logistics of where to go, and the specialness of serving the Lord in community worship. We promoted the event through social media, the bulletin, the monthly newsletter, and by individual snail mail invitations. I include a brochure outlining all of the Faith Milestone events scheduled throughout the year to impress our intentionality of our partnership in their children’s spiritual journey. I opened our time with the story of Samuel. He served in the temple as a young child. He probably did every small job you can imagine: emptied trash, cleaned up after others, dusted, swept, made beds, etc. He would also know all the secret places in the temple. He’d know all the warmest places in the winter and coolest places in the summer. And when God called him into ministry, he had grown such great relationships with the leaders at the temple, he went to them (Eli) for clarity, knowledge, and direction. This is what we hope for our students: they’d know the spaces and places and grow in such strong relationships they’d be connected to the local church for life. Then we played a game of tag of multiple items in the sanctuary so they’d be reminded or learn the vocabulary of the worship space: chancel area, organ, mic stand, communion table, back worship table, narthex, piano, keyboard, lecturn, pulpit, flower table, baptismal font, tech booth, etc. Pastor took the remaining time teaching them the symbolism and logistics, giving ample opportunity to practice, of lighting candles, offering communion, and using a microphone. Lighting candles: why we light, when we light, when we extinguish, why we bow, where to go, where not to go, how to light, what happens when it goes out, walking too fast, walking too slow, which aisle to travel, which stick to use, etc. And then we practice. Offering communion juice: why we use the elements of bread and juice, when we come up, when we finish, where do we look, how do we walk, where do we go, how do we clean up, what do we say to each person, how we smile, etc. And then we practice with a full chalice. Next, we learn to use a microphone. How to speak, when to speak, when to clear our throats, how to address the microphone, where do we look, how do we hold things and speak, etc. And then we practice with a live microphone. I jump back in to finish the training explaining the act of hospitality they are doing when serving in the worship services. We address appropriate clothing to wear, shoes to wear, readiness to serve, their freedom to say, “Not today,” when invited to serve, and personal hygiene. When we serve, we don’t want anything we do to be a distraction. So, yes, I went there about brushing teeth, combing hair, taking a shower, and using deodorant. They thought it was funny, but they’ll remember it. Parents were not invited to stay for this Faith Milestone since we scheduled it right before CLUB345. This gave the students who had never come to CLUB345 a natural ‘in’ to start. This is the night we pack and stack the Christmas shoeboxes. We had a full house! 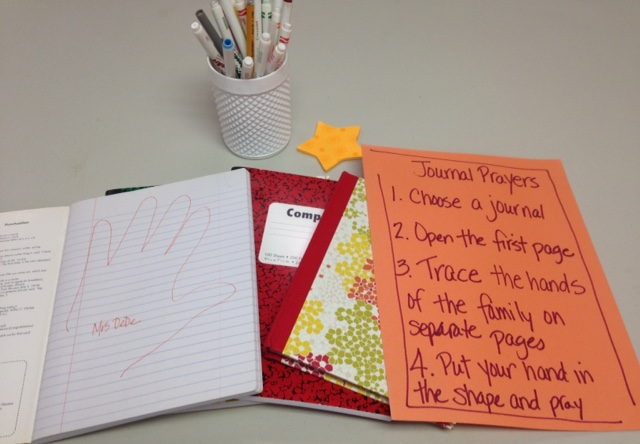 Kindergarteners and 1st graders are very image-led so it seemed the perfect age to learn to pray and practice praying with visual prompts with their families. 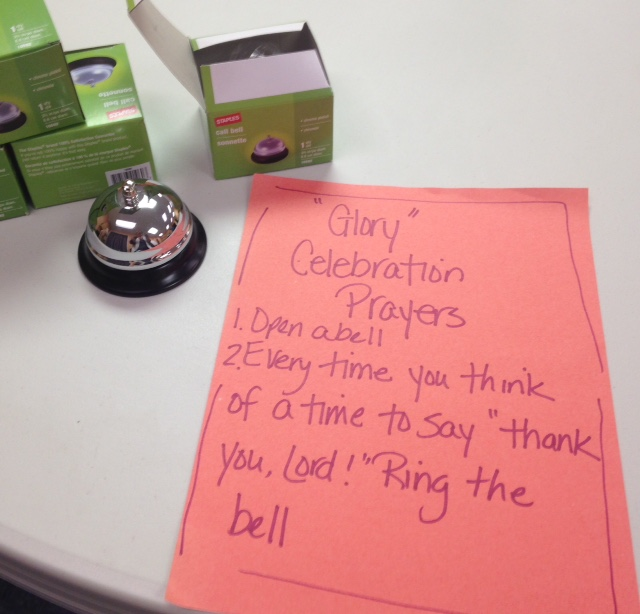 When we set the date for this Faith Milestone, we chose a few months after school began so we could use centers and circle time spaces the children had grown familiar with at school. We announced it in the bulletin, sent personal emails, and a formal invitation. 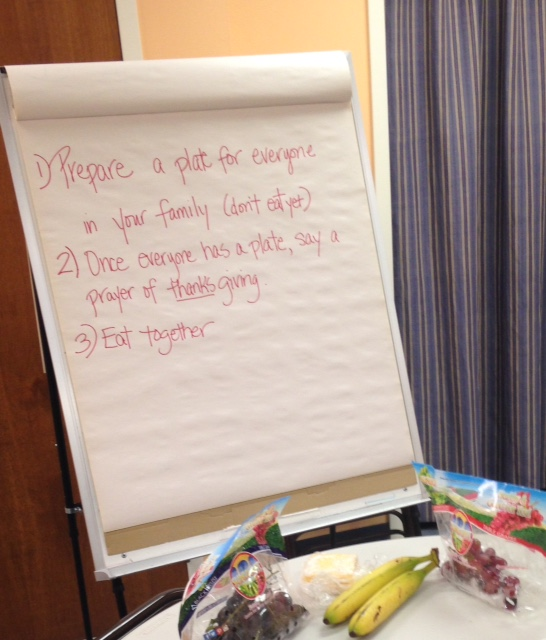 We set up the room with several round tables as centers, a place to eat cheese, crackers, and grapes, and a circle time space to begin filling “Prayer Kits.” The students gathered first at the circle time space to get their red bags to fill as they moved from center to center with their parents. I asked them “Do you pray?”, “Where do you pray?”, “Who do we pray to?”, “Why do we pray?” which made for precious conversation. 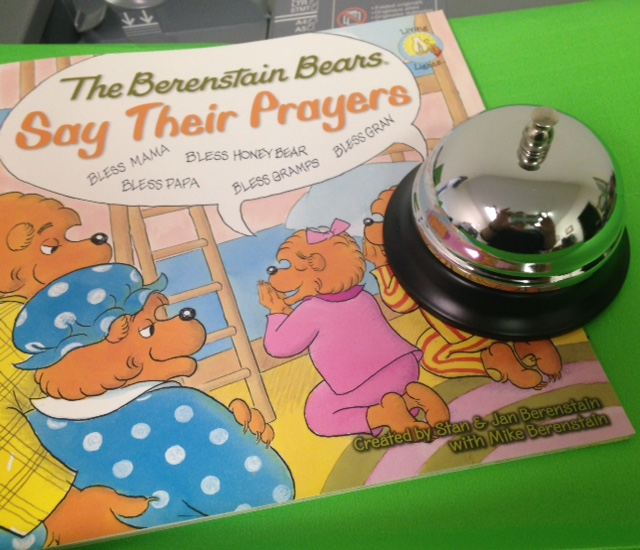 I read the first few pages of The Berenstain Bears Say Their Prayers and invited them to pick up a yellow clothespin to be clipped at home near their toothbrushes so they are reminded to pray when they brush their teeth. Then we sent them on to the prayer centers with their parents. This first I Can Pray event proved especially delightful to me as my students were all boys and it was their dads who participated. Pure sweetness! 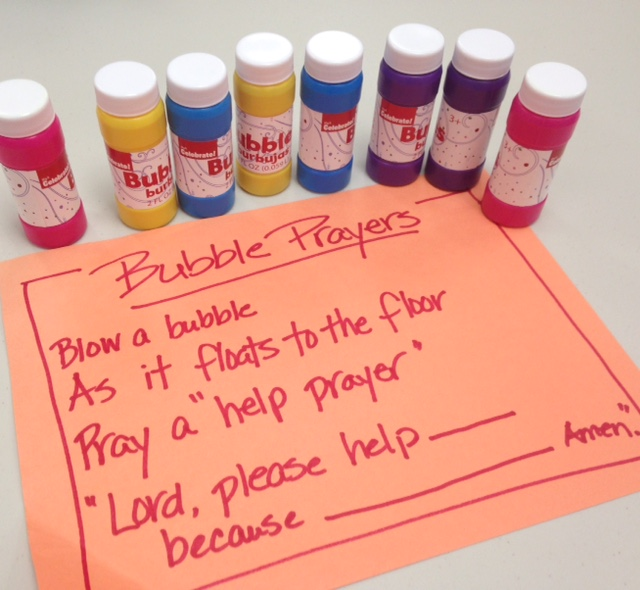 They brought home their prayer kits that included a bottle of bubbles, a silly putty egg, a Berenstain Bears book, a starter journal with hands traced, a yellow clothespin, and a glory bell. It took all of about 45 minutes immediately following the 11 o’clock service. I’ve heard from one of the dads since the event who shared that his son came home and shared everything with his Mom and they are sharing in prayer every day. Could I ask for anything more? Our students worship with their families. We offer nursery for students up to age 4, but we continue to involve and make our worship services family friendly with visuals, participatory experiences throughout the service, call and response moments, moved the sermon to the middle of the order of worship, and invite many voices as part of our services. We wanted our children to know about what they saw, so we made Touch and See My Church a Faith Milestone for our 1st and 2nd graders. 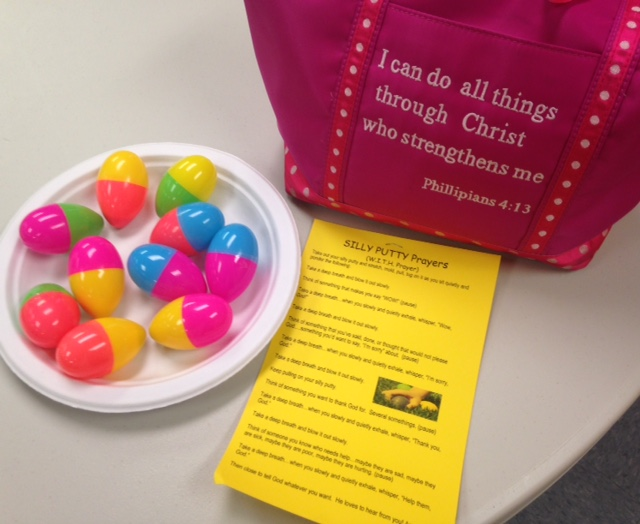 The goals of Touch and See My Church, held a few weeks before Palm Sunday, are to familiarize the children with worship components and connect them to the people in worship leadership. 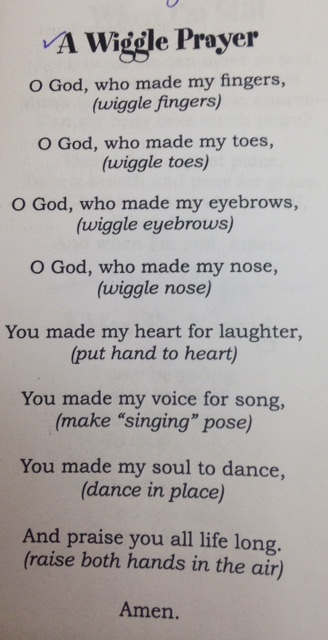 The students also learn why and how active participation in worship is important for them. Meet & Greet – the students move as a large group and interview several folks in worship leadership asking 4 basic questions: 1) What do you do?, 2) Why do you do it?, 3) Do you like what you do?, 4) How did you get to do what you do? (volunteer, pray about it, went to seminary, etc.) The students interviewed (in different places in the Sanctuary) a worship singer, a musician, an acolyte, a worship leader, our pastor, and the church secretary. The students get stickers as they move in a group from person to person because it gives us a sense of accomplishment and all kids like stickers! Snack Lunch – meatballs in the a crock pot in hot dog buns (how we do meatball subs) with cheese balls and ice water is a snack as we show a teaching segment on something in the sanctuary from Chuck Knows Church. Families get a chance to chat with other families and we read a few sections of Come Worship With Me. We laughed through the debrief and we offered a Look and Find Bible (purchased in bulk inexpensively from a Children’s Pastor’s Conference) for the student to take home and share with his/her family. We sent an email 3 weeks out, sent a snail-mailed invitation 2 weeks out, then reminded with text messages the week of. Scheduled it for immediately after worship while the leadership and the ‘physical items’ were still in place and the sanctuary was just recently used, 12:15pm-1:30pm. Psalm 118:26 Blessed is he who comes in the name of the Lord. From the house of the Lord we bless you. Even in the midst of Summer Jubilee (same Sunday summer schedule, but it looks different, and lets our regular, faithful Sunday Saints enjoy a season of rest and refreshment) and Vacation Bible School (ours is the first week of June), I’m already thinking about this fall, next year, and five years from now. 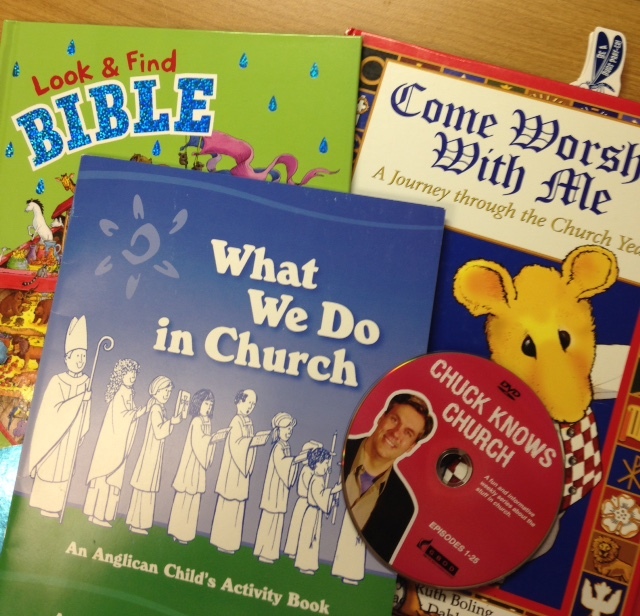 So to get the collaboration ball rolling, we planned a Children’s Ministry Stakeholder Event. A stakeholder is any individual or group who can affect or is affected by the actions, decisions, policies, practices, or goals of the organization. We will celebrate where the Lord has taken us, brainstorm to meet the needs of our continued growth, and dream for where we are headed over the next five years. Any and all stakeholders are invited. Dessert is included! What areas of McEachern Kids has your child(ren) participated in over the last year? (check all that apply)…then listed everything from Sunday school, Children’s Church, VBS, Winter Ball, Faith Milestones, everything. What areas of McEachern Kids would you plan for your child(ren) to participate in over the next two years? (check all that apply)…then listed everything as in the first question. What areas would you want your child(ren) to participate in if offered by McEachern Kids? (check all that apply)…then listed Cherub Choir, McEachern Kids Glee Club, Manners & Etiquette, Self-defense, Book Club, 5th Grade Transitions (cell phone safety, anti-bullying, Wonderfully Made/faith & sexuality, healthy communications, etc. ), Life Skills, Other (please elaborate). 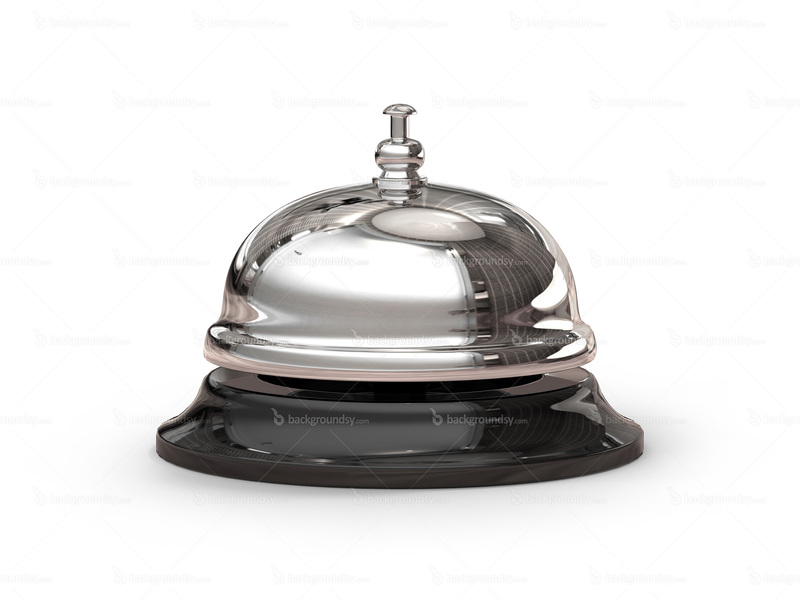 What is the best way to communicate with you?…then listed church website, email, text, postcard, Facebook, Instagram, flier, newsletter, bulletin, other (please elaborate). Just to let you know: email is still king! How will you serve this year? The event itself did not turn out the response numbers I had hoped, but those who did attend spoke well of the ministry and what was important to them, championed for their ‘if we only did one other thing outside of Sunday school and Children’s Church what would it be’, and what we can take a break from. I heard each one. As a result, it was more important HOW we did what we will do, and I am so grateful to have had a sounding board for the logistics. How have you begun to evaluate the past year and plan for the next school year? Faith formation is not just a Sunday morning activity. There are firsts, milestones, rights of passage with specialness wrapped all around which can offer faith experiences and sticky spiritual memories. I believe each local church, each family even, can prepare an ordered format of FAITH MILESTONES offering intentional firsts as part of a student’s faith experiences. A retreat is time away from our normal life for the purpose of connecting with God on a deeper level. 1 Peter 4:10 was the focus of our day away at Ms. DeDe’s for rising 4th-6th graders and last week’s annual Deep & Wide Retreat: where we go deeper in our relationship with God and each other & where we look wider in our scope of influence than just our own little world. $45 per student provided supplies, lunch, snacks, dinner, movie tickets, rental van to carry everyone to and from, and a great tshirt. Our AMAR District summer interns brainstormed the scripture, the schedule, the activities, and the supplies needed for the kids to learn more about their personality gifts, their spiritual gifts, and practice serving others in their every-day. Parents pick up and drop off at my home. Most of them carpool because I live 40 minutes north of the church. Finding painted rocks are huge in our area, so we started the morning by painting rocks we would later hide on the playground and in the pool area of the neighborhood to delight others we would know nothing about. What happened? After going swimming the second time, we observed and heard the squeals of a family as they were finding our painted rocks and uploading pics on the Canton Rocks Facebook page. Take and discuss the different personalities and how accurate they are. How can we use this to better understand ourselves and others? Discuss how better knowing who you are, and your gifts, helps you better understand how you can help serve God’s purposes. The different colors and personalities each offer different ways to best serve others. Dissect the 1 Peter 4:10 scripture. Discuss how we must work together as ambassadors for the Lord. How to use spiritual gifts to serve others in church, at school, in the community, and in the world. God can use even what you think is the smallest of gifts. David was small and though he was young, yet he protected his people with God’s help and a little slingshot. Esther was a woman in a time where women did not have any power, yet she saved her people by changing the king’s mind. Gideon was a farmer, but God made him into a mighty warrior who saved the Israelites from the Midianites and other meaners. Rahab was an innkeeper whose strong faith in a God she’d only heard about in stories led her to risk her life by hiding spies in her home. Moses ran away from God at first due to fear, but then he led the people to the Promised Land. Noah picked up his family and built an ark due to his huge faith in God. Proverbs 19:21 & 1 Peter 4:10 Discussed how, in the movie, each car had a different gift/purpose though all were cars/vehicles. Though McQueen had gifts he used to win, he also had gifts he could use to help others win. Jesus served others in many ways, never taking the glory for himself, rather giving it all to his Father. Discussed how each student could help others win. 8-9pm Returned to pack up for pick up and enjoy fruit sorbets (a tradition) Discussion of how they served each other today, their experience watching/hearing the family making painted rock discoveries, how they can carry on serving the others they live with (family), at church, and in their community. I love these kids. I love watching the older ones teach and coach the younger ones. I love hearing the stories and seeing the comments on social media sharing their Deep & Wide Retreat experience. Enjoying their company in the everyday with the thread of the scriptures throughout makes for sticky spiritual memories. The interns and I debriefed realizing we accomplished a lot in one day without rush or mishap. We engaged every learning style and offered laughter, competition, creativity, and all the physical needs through food and lots of water. You can find out about past Deep & Wide retreats here and here. The amazing tshirts (designed by the interns and our friends at Sportsprint) we’ll wear to church on Sunday. What does your kid’s first retreat look like? There are so many things that thrill me to the bone about serving Jesus with little people: singing, dancing, teaching, candy, nursery photos of baby silliness, games, the Bible, children’s moments, faith milestones, field trips, camping retreats, dancing (love me some dancing before the Lord so it gets listed twice), and the laughter, oh the laughter. Testimony – I will be challenging my students to give testimony. Think “Show & Tell”, but about what God is doing in their lives and using the power of their spoken words to claim His presence in their every day. Our church 2017 theme is to “Let the light of Jesus shine through you” and I wish for their words to do just that with boldness and confidence. Wesley Chapel Academy – We will begin a series of Friday evenings to learn life skills. After setting up the EventBrite registration, the first class filled up in less than 48 hours. I think we have something here! A dear colleague in my home state of Louisiana shared her organizational plan and the first Academy class is less than two weeks away. Keep an eye on the blog for specifics. Fifth Grade Only Retreat – Our denominational conference is offering a two day retreat for fifth graders specifically addressing ways to worship at our favorite retreat center, Camp Glisson. The place is holy ground for our kids and I am thrilled to be going in March. Blogs will follow for sure! Done In A Day Training – Anyone who serves the Lord with little people will find this Saturday training 9am-12noon super-duper-helpful. Video driven plenaries and workshops with multiple stops for discussion, sharing, and hands-on responses will focus on what we all do every.single.week. : Connecting Kids in Worship, Connecting Kids in Mission, and Connecting Kids in Sunday School. The best thing is that this is taking place in every single district in the North Georgia Conference, at the same time, on the same day! I can’t wait to see what we can get done in a day to bring home to our kids. What is thrilling you to the bone in the next 90 days?